"I give myself a C-plus for the day. I have come a long way this year. It's good just to be in the mix and competing with these guys again... In the final stages I didn't really commit like I wanted to." Freshman Laura Hoer of NC State win Roy Griak! Toronto Waterfront Marathon: Kenneth Mungara (2:07:57) and Sharon Cherop (2:22:42) Both Break Kenyan All-Comers Record at Scotiabank Toronto Waterfront Marathon Canadian Reid Coolsaet ran 2:11:23 to make the Canadian Olympic standard by 6 seconds. Sharon Cherop got the women's win in 2:22:43 by 1 second over Tirfi Beyene which was faster than the winning time in Berlin. Stop the Presses: Say it Ain't So: Menjo Loses at Lisbon Half Marathon, Mary Keitany Romps Races need to do a better job of promoting Menjo. We had no idea the LetsRun.com superhero was running. In case you have no idea what we're talking about Menjo earlier this year solo'd a 3:53 mile, a 12:55 5k, and the world leading 10k. Galen Rupp Gets Married We can't believe no one has posted on it yet, but the wedding was yesterday according to the wedding website. Congrast to Galen and Keara. 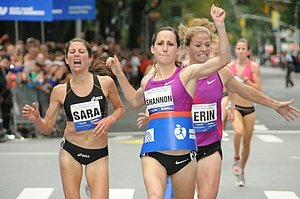 LRC Recap: Shannon Rowbury Caps Season With Win in NY Many people expected Shannon Rowbury to repeat on Sunday on the streets of New York but she had a tough brawl with New Jersey's finest Erin Donohue. Rowbury won last year and used her road skills to time her kick perfectly. 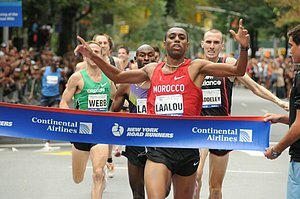 Men: Amine Laalou Earns Some American Respect Amine Laalou had the top 800 and 1500m time coming in, but everyone was focused on the strong American contingent. All the main contenders including Bernard Lagat were there with 100m, but Laalou got the win.